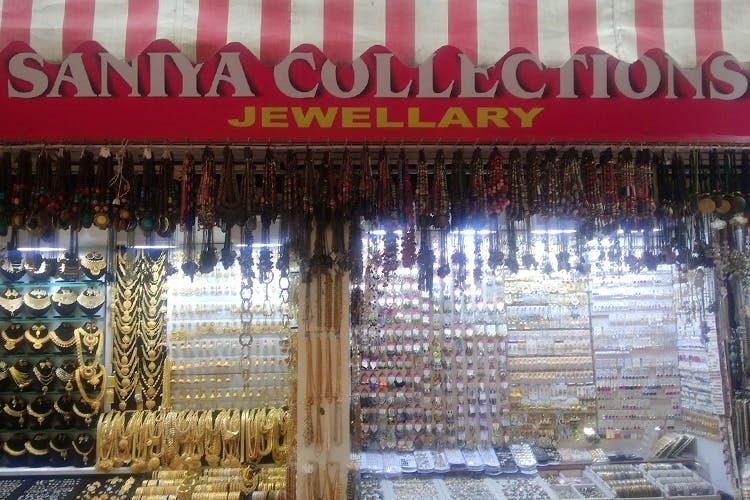 If you’re looking to add an ethnic touch, or some solid quirk to your outfit, but don’t want to spend too much, look no further than Saniya Collections — a little accessories store in Commercial Street. One of the myriad jhumka stores dotting Commercial Street, Saniya Collections stands out from the crowd. Why? Because not only do they do interesting danglers — chunky chandelier earrings or delicate long drops, in metal, plastic and sometimes cloth, but you’ll also find some merch that is on-point when it comes to pop-culture. Like the Hello Kitty earrings, pirate ship studs and even good luck Greek owls. OK, don’t say I didn’t warn you — you’ll want to buy everything. So all you broke folks who don’t want to compromise on style and staying on trend, this one’s for you. After all, most of the stuff is just INR 50! I am still amused by the Hello Kitty danglers. But if that’s too childish for you, check out the skulls and crossbones, pirate ships, Goth chic studs, and animal shapes. They even have some funky 3D cubes, wooden polka dotted squares, and rainbow thread-work that look like conical danglers. Being into monuments, I scored myself a miniature version of Eiffel Tower and also some wildlife danglers — turtles and elephants. The shop is big on ethnic danglers too. I am in love with their colourful domed chandeliers and popping bright thread work jhumkas for that casual ethnic look. If you’re looking for something more elaborate or intricate for special occassion, they have a separate section just for artificial gold jewellery. They also sell other accessories like anklets, nose rings, necklaces and bangles. The prices start from INR 50 to INR 650 for casual accessories. But being Commercial Street, feel free to bargain away like I did!